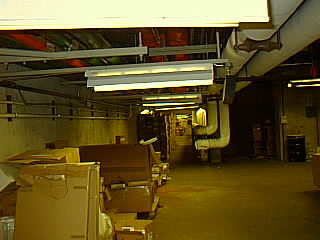 A Nuclear Shelter underneath the main Library with a huge stack of boxes marked "Dept. of Civil Defense". 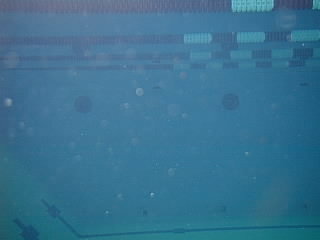 A window into the swimming pool of CCC (the student union bldg). 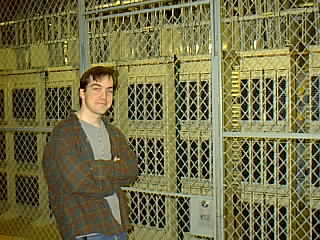 A room used to store containers of nuclear products with a ridiculous lock that opened when jiggled. 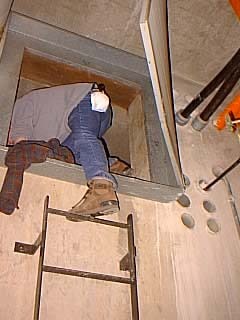 One unfinished section of tunnel was accessed by climbing up a ladder into a crawl space above the basement but below the floor. All the photographs taken are low-res (320x240) and approx 20K each. Use machines/monitors capable of thousands of colors for best results. 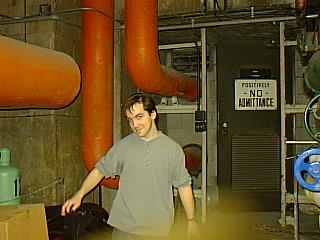 Ben and Sam at the intersection where the pipes from the Utilities Building split up to serve the rest of the campus. 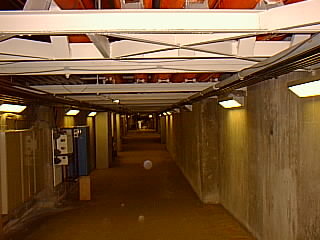 The basement of the library was huge. 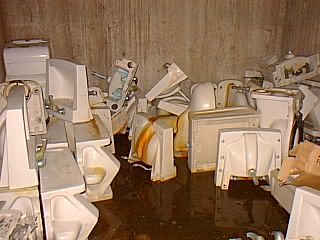 Apart from old bookshelves, bins, tables and other junk, we found theCampus Telephone Switch and a room full of old broken toilets. 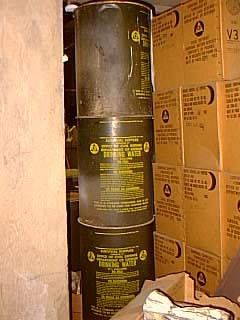 The most fascinating was the huge stack of survival supplies. 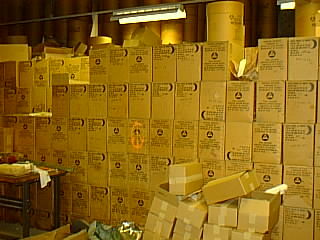 These boxes were marked "Department of Civil Defense". 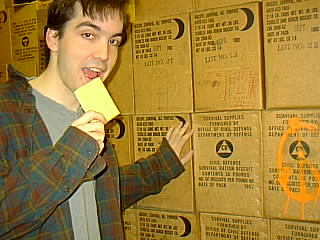 Some boxes contained tins of biscuits which Ben decided to try. 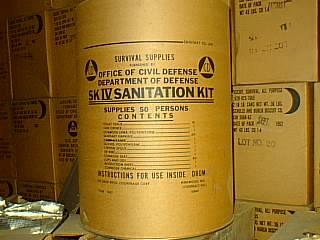 Other boxes contained Sanitation Supplies including Iodine. 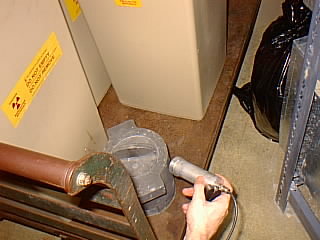 We also found large stack of Drinking Water barrels which could be reused as commodes. 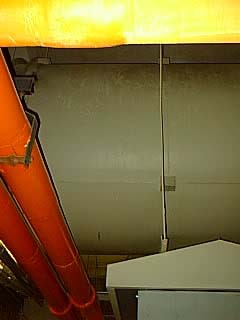 We found out that most tunnels were pretty much alike. 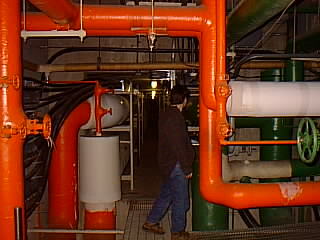 They generall consisted of 6'x8'(widthxheight) tunnels with steam and cold water pipes running along the sides. 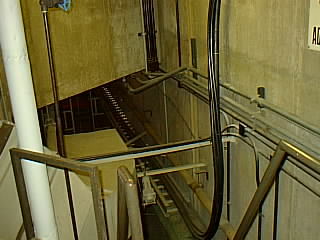 Usually the floor was of concrete and in some cases, where the tunnels branched off to serve individual buildings, there were metal grates on the floor.The data wiring was one side and the electrical cables on the other side. 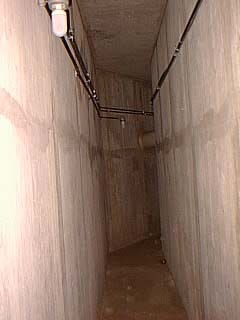 Most basements were at a higher level than the tunnels and access to the basements was via steep metal stairs. These stairs were kinda cool. 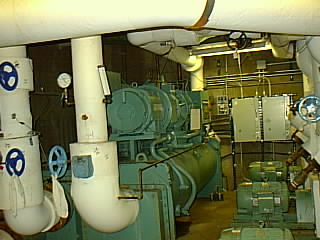 The basements were generally all alike with huge tanks marked DCW(Domestic Cold Water). 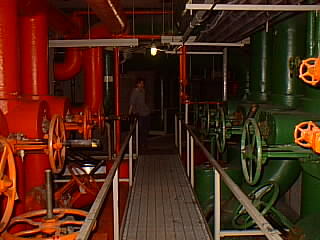 There was a lot of pumps, generators and other equipment. 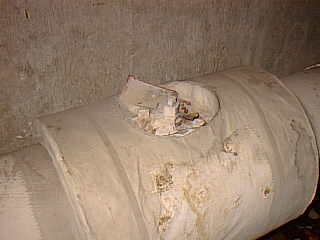 Generally, the entrance to the tunnels from the basements was marked with a huge Positively NO ADMITTANCE sign on a door that was *unlocked*. 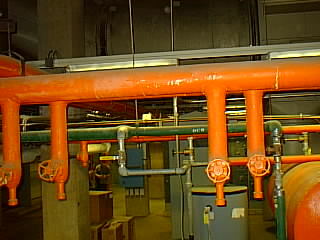 We also found a leaky steam pipe valve. 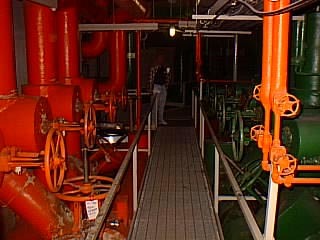 The tunnels had circulation fans which led to air openings. 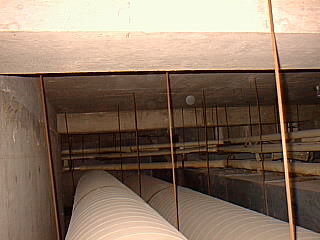 Huge pipes over 20' in diameter were seen in some basements. 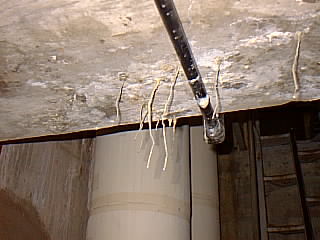 Some tunnels had delicate stalacites (or is it upside down stalagmites?). 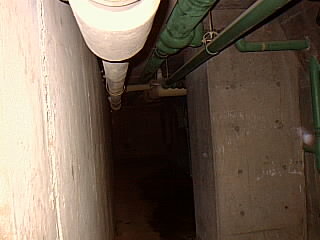 Some basements had narrow (2') passages which led to manhole entrances. These were a bit uncommon. 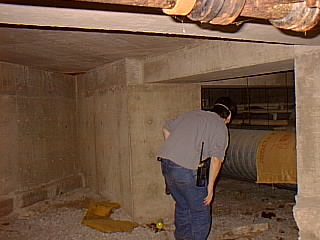 We found a large unfinished crawl space underneath the Art&Architecture Building. 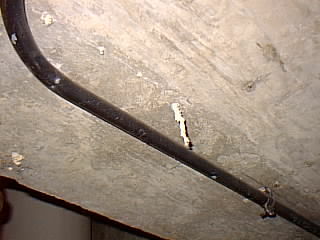 The cool part was that it was partially hidden and was accessible by climbing up some stairs and entering through the short entrance. This was the only place which was not lit. Due to the flash, the room appears bright but it was not so. 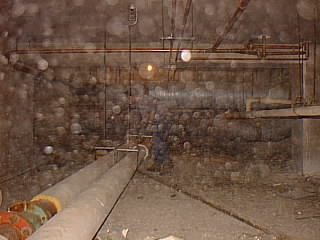 The place was quite dusty and we had to use face dust masks in case of asbestos. 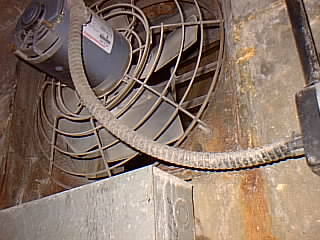 The air filter was over 20' tall. 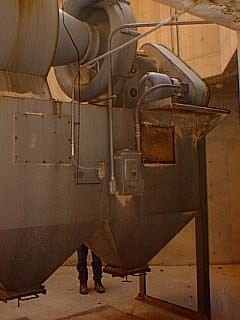 Another picture of this machine which seemed like alien construction to us. 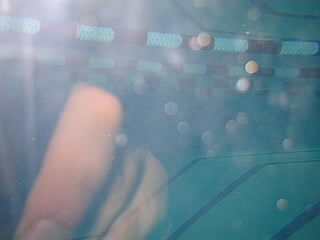 The basement of CCC (the student union) building had this window into the pool. 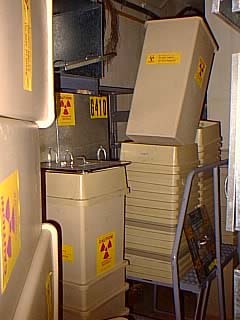 Another blurry photo..
We also found a small storage room in the basement of the Science and Engineering Labs which was used to store radioactive material containers. 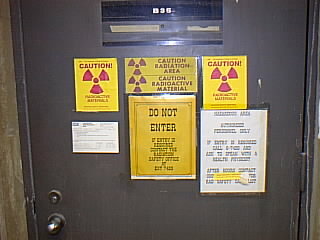 There was even a Geiger Counter on the floor. There must have been something wrong with the lock because it opened when we simply jiggled the lock. 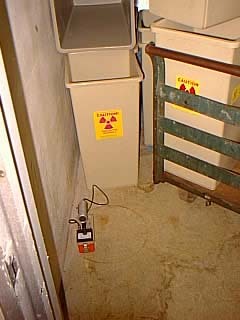 There was radioactive material in that room because the counter started pinging when we tested some of the containers. We left that room alone! 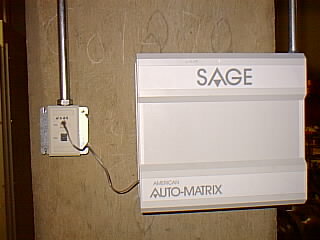 We found a SAGE Auto-Matrix computer of some kind. 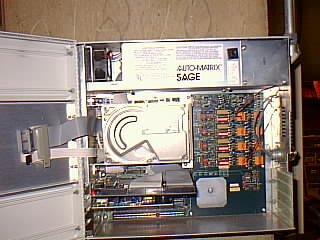 It seemed more or less a standard personal computer on the inside with a hard disk etc. It was hooked to a telephone. 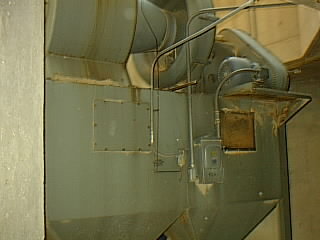 It must have been some kind of computer to monitor the HVAC system and generate alarms if something breaks down. But, I am guessing here. 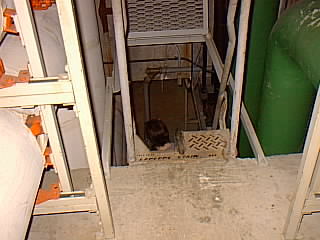 There was some really long tunnels. 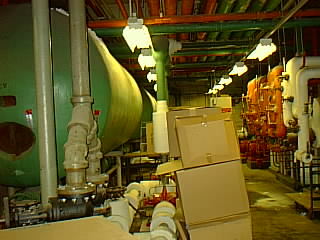 We came across one tunnel that had thousands of light bulbs stored along it.